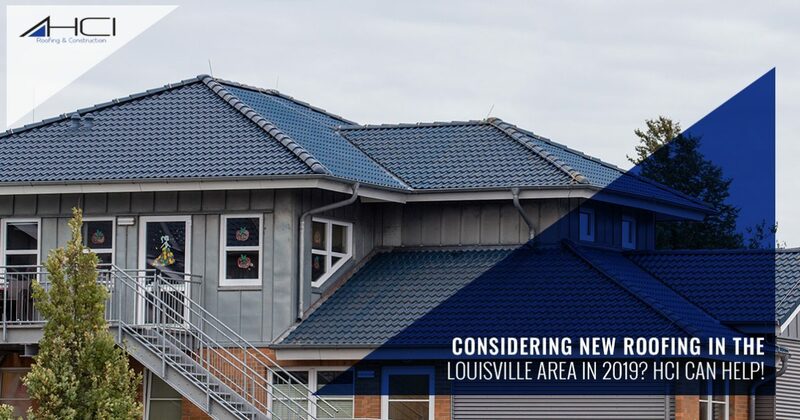 Louisville Roofing: Considering New Roofing In Kentucky In 2019? HCI Can Help! Considering New Roofing In The Louisville Area In 2019? HCI Can Help! It’s already the new year, and before you know it, 2020 will be upon us. While the time can seem to fly for many residents across Kentucky, it’s important to remember that your roof system does not forget the changing of the seasons and the panoply of wear and tear sustained from heavy winds, rain, and snow. If you’ve noticed that the roof that protects your home or business is looking aged and worn down, 2019 may be the perfect time to consider professional services from a local roofing company. HCI Roofing and Construction has served as Louisville’s trusted roofing contractors since 1998, and our team is here to provide a full array of services to deliver complete protection and peace of mind. Catch up on a few of our top services today before calling for your free, no-obligation estimate. Regardless of your budget or property needs, the team at HCI is here and ready to help! Leaks, drafts, infestations, and more can all cause a lot of concern and result in costly services later on. As the owner of a home or business (or both), it is vital to ensure that your roof system is up to date and protected against weather and critters, and our roofing contractors are happy to help! Gutters — Clogged or damaged gutters can lead to serious concerns for your roof, walls, and foundation. Shingles — Cracked, curling, or faded shingles can all be a sign that the age and wear of your roof is adding up. Flashing — The metal that protects the edges and vents on your roof is essential for keeping moisture out. Fascia — The front-facing element of your home’s roof can undergo a lot of wear and tear throughout the year. Soffits — The wood overhang beneath your roof is an ideal place for animals and insects to sneak in. Our roof repair specialists will correct cracks, rot, and holes. In some cases, a new roof installation for your Louisville property may be the best value. Many residents try to rely on roof repairs to avoid a larger price tag, but at a certain point, these repairs aren’t worth the effort. HCI Roofing is here to provide exceptional results from start to finish, and our contractors will work to ensure that every stage of the project is completed to perfection. We have a wide variety of roofing materials to ensure an ideal installation for your property, including asphalt, cedar, slate, and barrel tiles, EPDM, metal seams, and more. From the removal of old materials to flashing repairs, paint touch ups, comprehensive clean ups, and a final inspection, HCI works to deliver complete quality. Our roofing contractors will provide accurate estimates and will not ask for a deposit on our services. Payment will be due only when you are completely satisfied with the results! Our roofing repair pros can also help to create an ideal outcome for your home or business’ gutter system. Properly functioning gutters are essential for moving rainwater out and away from your structure’s sidewalks and foundations. It can prove a nuisance trying to clear your gutters from leaves and gunk every year. In most cases, this can become a hazardous chore as well! HCI Roofing and Construction relies on Leaf Relief® from Ply Gem to provide outstanding protection from all of the debris that comes down on your roof. Constructed of aluminum and installed by our roofing contractors, this system is affordable and warrantied for 10 years. Quality is our top priority, and our roofing contractors will work with you every step of the way to ensure you are happy with the results and the price. We offer ideal financing and also provide ongoing specials that can save you up to 2,000 dollars off of your roof installation. HCI Roofing and Construction in Louisville is here to deliver ideal results for homes and businesses across Kentucky. The new year may be a time for a new roof, and if you’ve been putting up with leaks for too long, our team is here and ready to help. Contact us today to learn more, and be sure to request your free estimate!